​ On the top of a white square box are two of the smallest TV screens one might have ever seen. They appear to be relics with obsolete cathode ray tubes that project fuzzy videos. The work intrigues audiences with its disoriented identity, making them wonder why those three-inch miniature monitors are attached to a set of vinyl straps. The title, TV Bra for Living Sculpture, informs us that the work is a metaphor for a woman’s bra, and the performer playing the cello in the video is the living sculpture. The work was created in 1969 by a Korean-American artist Nam June Paik (1932-2006), the founder of video art who performed often with his collaborator Charlotte Moorman. The neighboring photos and artworks show that the TV Bra is the costume for the Living sculpture Moorman playing the cello. Thus, the display of TV Bra itself as a small part of the whole performance art lacks the original context. From the understanding that an artwork becomes greater when it is integrated within itself and the integrated whole is even greater than sum of its parts, it is important to appreciate the work of art as the whole, which points to the meaning and work of performance in this case. In order to understand the integrated whole and its being greater from the artwork itself, this paper will look into the artwork, TV Bra for Living Sculpture. In the following it will examine its physical/formal elements and analyze the internal/external relationship and tensions and conflicts around them. It will finally show how the greater meaning of the artwork across time and is revealed and constructed. TV as a medium and object itself has been the center in Nam June Paik’s artwork for over 40 years. TV was a canvas, music score, sculpture, and performance for him. He experimented media with various kinds of video, satellite, broadcast, robot, and laser and developed them into tactual and multisensory ways of communication. His pursuit of crossing various genres of media reflects the Neo-Dada movement of avant-garde group Fluxus in the 60s and 70s. He participated in the movement where the goal was to ease the boundary between art and life, which was influenced by the composer John Cage (1912-1992) and the artist Marcel Duchamp (1987-1968). Paik’s artwork mirrored the idea that “the medium is the message”, the one that the media critic Marshall McLuhan (1911-1980) articulated in the book Understanding Media in 1964. McLuhan and Paik argued that a medium itself should be the focus of study as it affected the society not only by its contents, but also by the characteristics of the medium itself. Their perspectives have changed the traditional view that considered media as no more than a conveyer of the message. More importantly, their positive view on the media opposed to the prevalent concerns at the time. Science and technology were often negatively described in dystopian science-fictions such as George Orwell (1903-1950)’s 1984 in 1949 where the developed technology was conceived of as a tool for endless censorship and surveillance. Many critics also warned of the media-dominated and information-saturated world in the coming future. For example, Jean Baudrillard (1929-2007) pointed out that our reality was being replaced by massive “simulacrums”, and Guy Debord (1931-1994) was anxious of a life being artificial, alienating and inauthentic by media. While they recognized the fact that people have developed much numbness by the dominance of technological media, McLuhan and Paik insisted that media had suggested a new opportunity of communication. Nam June Paik pushed further this idea in his art and has sought “humanized technology”, which reflected an utopian ideal of Zen Buddhism where innate qualities of nature and technology believed to be real and distinctive would eventually diminish. ​ ​Paik first focuses on the form of his artwork in pursuit of humanizing technology. The performance TV Bra for Living Sculpture leads us to experience optical illusion or metaphysical insight with its dynamic images. We encounter the moment when the shape of cello coincides with Moorman’s body, the moment that body becomes music and music becomes body. We are even able to see the screens of the TV Bra as a visualized music. However, if the artwork was not a performance, the same cognitive process would not have triggered well due to several noticeable visual conflicts. The conflict (or difference) between the shape of TV sets and that of Moorman’s breast is so intense that it is hardly to notice that the straight-square shape of TV sets and the electrical images on their screens contrast with flesh of human body. Our perception instinctively divides between organic and non-organic, human and machinery, nature and technology. Paik prompted the performance to overcome the visual clash in static status, forcing the performance as an even more radical way. Interestingly enough, the video of the TV Bra at the performance was not in the prerecorded tape as today, but it was a real-time system, showing either actual TV program being broadcasted at that moment or through a closed-circuit image captured by Paik as he walked among the audience with a video camera. (“Putting the audience’s faces on my brassiere,” was Moorman’s description of this method). 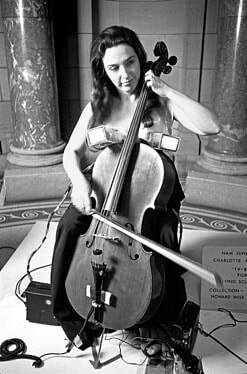 While she played her cello, Moorman raised her foot on the pedals so that she could manipulate the video on the screen, and the sound of cello could influence the video with the magnets taped on her. Considering both of artist and audience as agencies for the creation of the art, this generative system reflected Paik’s pursuit of open and participatory communication through the artwork. He noted that one-way projection of TV at the time was a dictatorial, and so he pursued interactive and democratic communication by breaking and altering the original system of the TV. But the video of the TV Bra is replaced by a different video today, admitting the non-presence of the performance. The video artwork titled, Video footage for TV Cello, is what Paik created to show within the bra when the Walker Art Center purchased this work, which is compiled of Moorman performing various pieces, such as Paik’s TV Bed and Human Cello. It was Paik’s thought of new life of his artwork by giving new video for the TV Bra. 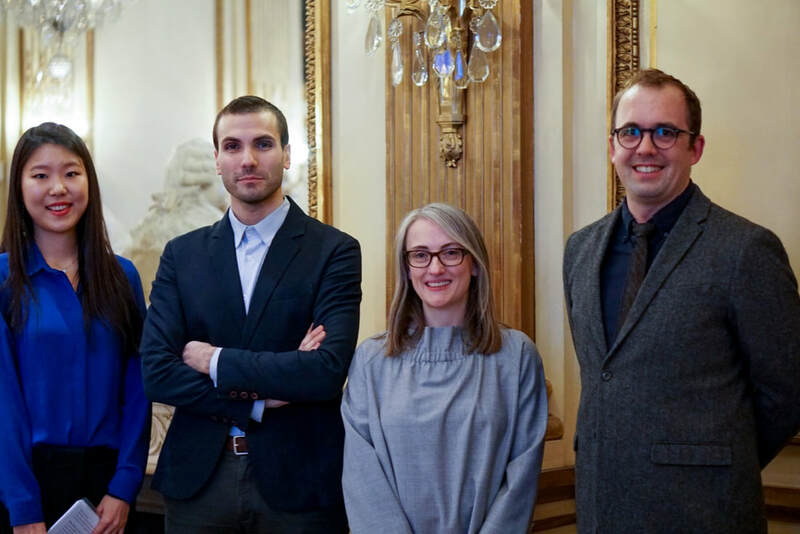 ​ MoMA’s media conservators Kate Lewis, Peter Oleksik, and Ben Fino-Radin delivered a lecture entitled “Media Conservation at MoMA” at the Institute of Fine Arts (IFA) on Monday, November 28th, 2016, as part of the “Topics in Time-based Media Art Conservation” series. 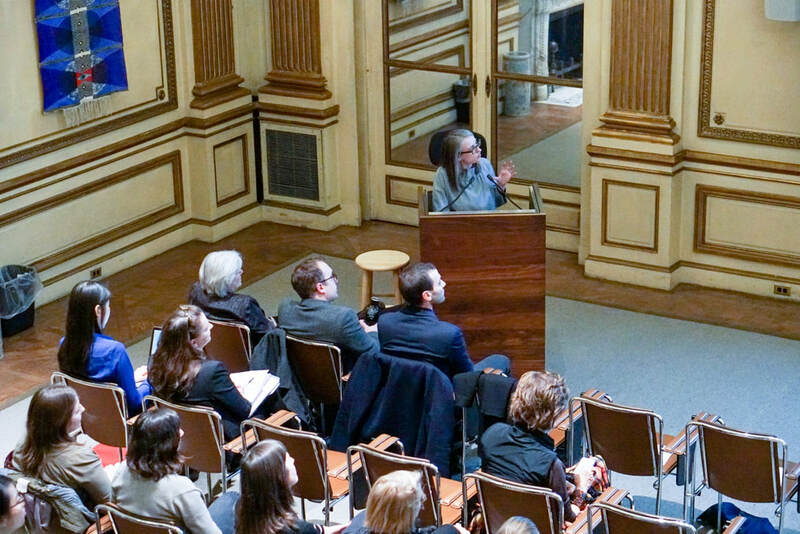 The lecture was structured in the three sections – Collection Care, Exhibition, and Digital Preservation – to highlight the core activities and shared responsibilities of the conservator’s day-to day work at MoMA. Peter Oleksik opened the lecture by introducing MoMA’s long and rich history of collecting media art, which started as early as 1935 with the acquisition of film-based artworks. With the launch of the video collection program in 1973, the museum also showed an early commitment to emerging video works and pioneering artists, such as Joan Jonas and Nam June Paik. Today, the museum houses one of the largest media art collections in the world and the media art conservation department – established in 2007 – has significantly shaped and served the field through major research and educational initiatives, such as Matters in Media Art. Oleksik guided the audience through the multifold tasks that constitute the collection care of media artworks, ranging from the recent digitization of 4000 analog videotapes to the assessment of born-digital works during the acquisition process. ​ Following this introduction, Kate Lewis discussed the exhibition of complex installations, such as the sonic work The Forty Part Motet by Janet Cardiff, to illustrate that artist’s installation specifications can be variable or clearly defined. Lewis stressed the importance of capturing different artworks iterations and argued that the exhibition of TBM artworks provides deep insights, which in turn can inform conservation practice. Her case studies clearly demonstrated the ethical and conceptual responsibilities of TBM conservation in light of ever-changing technologies. Subsequently, Ben Fino-Radin shared one of the most recent challenging projects he completed with his colleagues in 2016: the conservation of the work Lovers (1995) by the Japanese artist Teiji Furuhashi. Lovers is an immersive, interactive multimedia installation that shows life-size projected images of the artist and his collaborators from a tower of computer-controlled videos and slides. The artwork had not been on view since its inaugural exhibition in 1995 and as a result, the project involved major technical and ethical challenges that conservators often inevitably face, especially when TBM artworks have not been installed over longer periods of time. Due to the missing source code, the now-obsolete equipment, and the absence of previous artwork documentation, the conservation process required meticulous reverse engineering to understand the logic of the artwork. Fino-Radin continued his presentation by introducing MoMA’s “digital art vault” and the creation of Binder, a free open-source software, designed to manage the preservation of digital collections. Kate Lewis then concluded the lecture by announcing MoMA’s new “Media Conservation Initiative”. 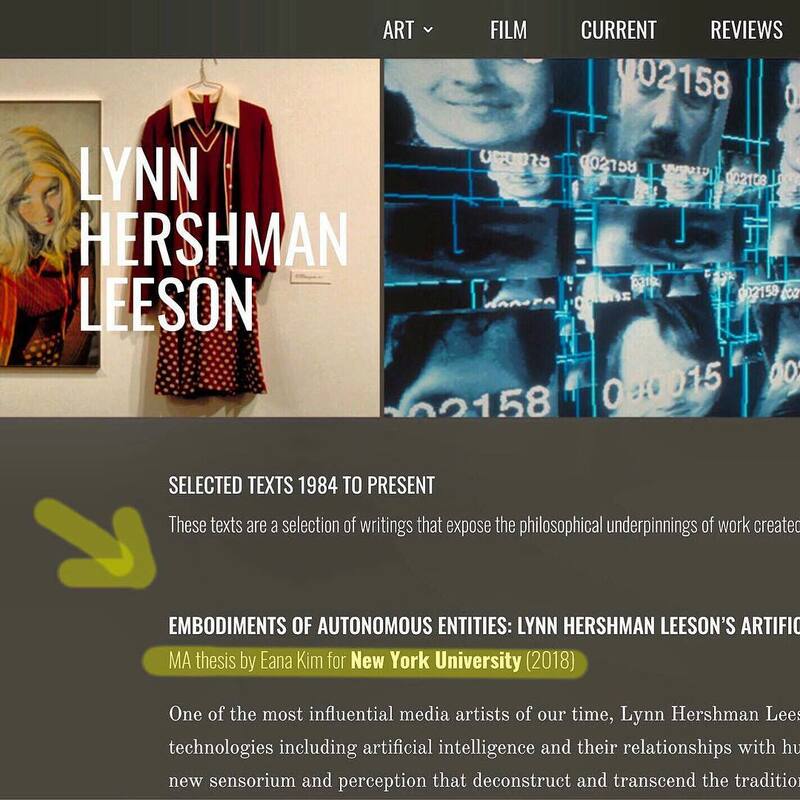 This initiative seeks to advance new strategies for the field of time-based media art preservation. The Andrew W. Mellon Foundation is funding this educational four-year project, which includes a series of TBM conservation workshops and supports four TBM art conservation fellowships. ​ The three speakers gave a very insightful overview of the current state of time-based media art conservation. It was delightful to see how their leadership and educational activities have served the field and contributed to TBM art conservation as a whole. A video of this lecture is available at: https://vimeo.com/194415009.